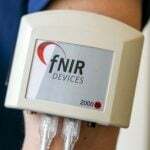 The most common form of indirect blood pressure measurement employs a pressure cuff, pump, and pressure transducer. This complete assembly is commonly referred to as a sphygmomanometer. A physiologocal sounds transducer can be added to detect the Korotkoff sounds. This application note details how to take a blood pressure measurement using the TSD120 cuff transducer, TSD108 physiological sounds transducer, and AcqKnowledge software.